In this classic guide to The Westminster Confession of Faith, A.A. Hodge examines each chapter of the confession in a clear and understandable way. 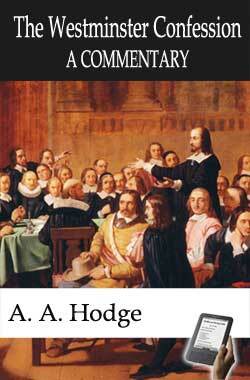 This volume is intended both to facilitate and stimulate study of the Westminster Confession and is excellent material for discipleship - designed for Presbyterians, but accessible and useful for everyone.He begins with a short history of the creeds and confessions in general and a history of the Westminster Confession in particular, including the historical and theological events which inspired its composition. Most of the volume is rightly devoted to detailed commentary on the Confession itself. Each chapter includes a detailed exposition of the Confession, and concludes with dozens of questions for review and reflection.Each chapter includes a detailed exposition of the Confession, and concludes with dozens of questions for review and reflection. A Commentary on the Confession of Faith also includes appendices which contain statements by Charles Hodge and Henry B. Smith, as well as the 1879 Auburn Declaration and the Declarative Act of the United Presbyterian Synod of Scotland. All that man is to believe concerning God, and the entire duty which God requires of man, are revealed in the Holy Scriptures, and are to be believed and obeyed because contained therein, because it is the word of God. This divine word, therefore, is the only standard of doctrine which has intrinsic authority binding the conscience of men. And all other standards are of value or authority only in proportion as they teach what the Scriptures teach. While, however, the Scriptures are from God, the understanding of them belongs to the part of men. Men illumined by the Holy Spirit must interpret to the best of their ability each particular part of Scripture separately, and then combine all that the Scriptures teach upon every subject into a consistent whole, and then adjust their teachings upon different subjects in mutual consistency as parts of a harmonious system. Every student of the Bible must do this, and all make it obvious that they do it by the terms they use in their prayers and religious discourse, whether they admit or deny the propriety of human creeds and confessions. If they refuse the assistance afforded by the statements of doctrine slowly elaborated and defined by the Church, they must make out their own creed by their own unaided wisdom. The real question is not, as often pretended, between the word of God and the creed of man, but between the tried and proved faith of the collective body of God’s people, and the private judgment and the unassisted wisdom of the repudiator of creeds. Appendix 4: What is Meant by Adopting the Westminster Confession?